This year I wasn’t planning on dying eggs however I was instantly intrigued by this way I found while browsing around on Pinterest. 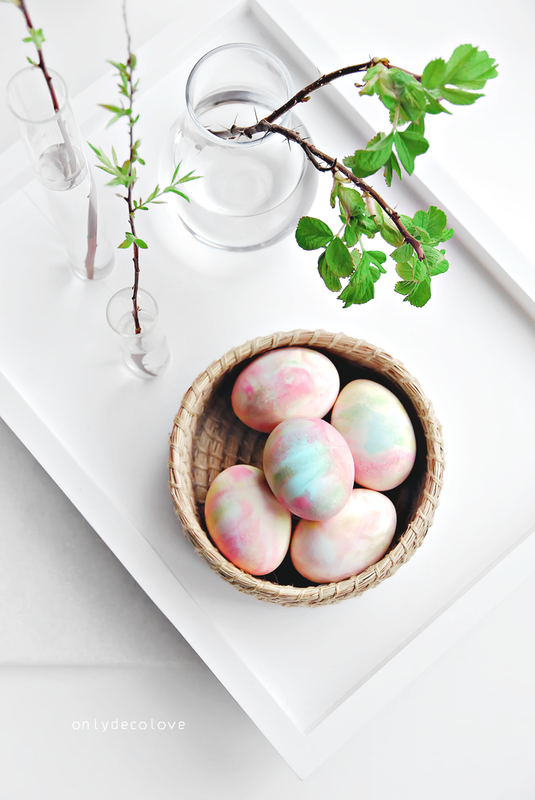 Instead of using any chemicals or elaborate methods that take a whole day to dye a dozen of eggs, this one only needs some whipping cream and a few drops of food coloring! The results are by far my favorite. 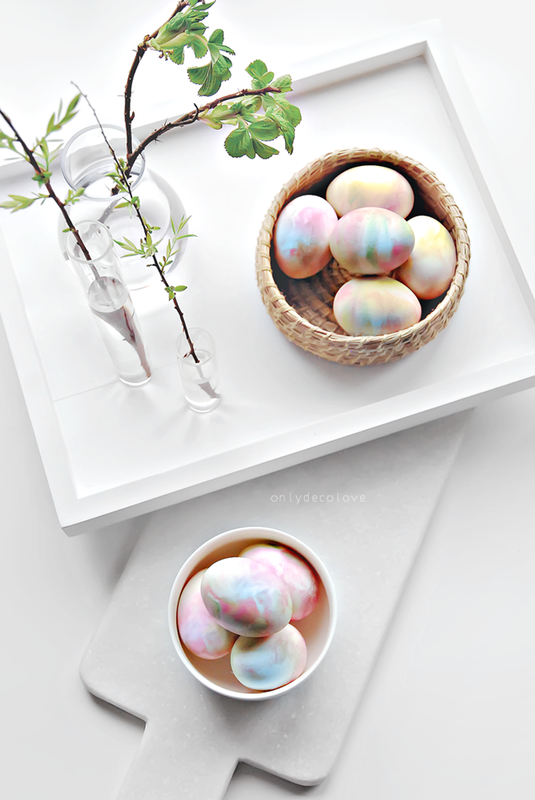 The eggs look like a beautiful water colored painting! 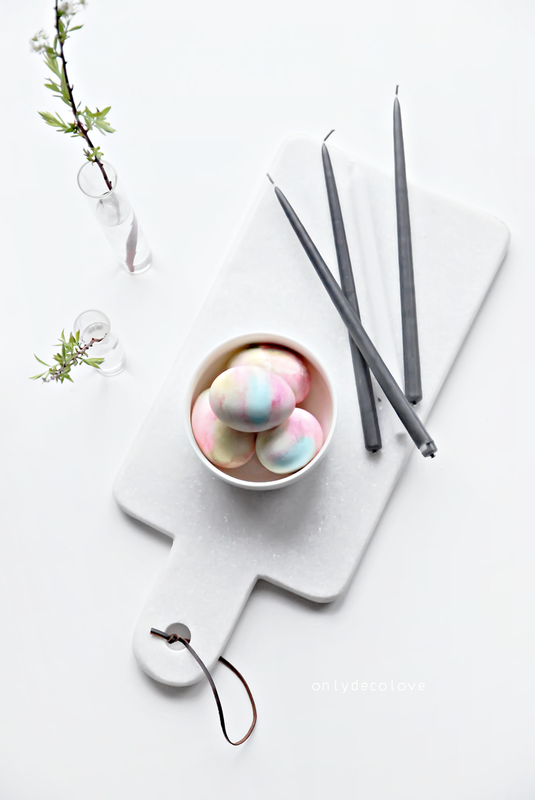 Scroll below for the method and photos of how to dye your eggs with whipped cream! I used a dozen of eggs as they are more than enough since we are only two people. The beauty of this method is trifold. 1. By using whipping cream and food coloring the eggs are completely safe to eat. 2. Time needed from start to finish is less than half an hour with preparation. 3. You can dye multiple dozens of eggs in the same time frame. With all these pros plus the fact that the eggs look absolutely beautiful I don’t think I will ever use a different method of dying them ever again. 2. 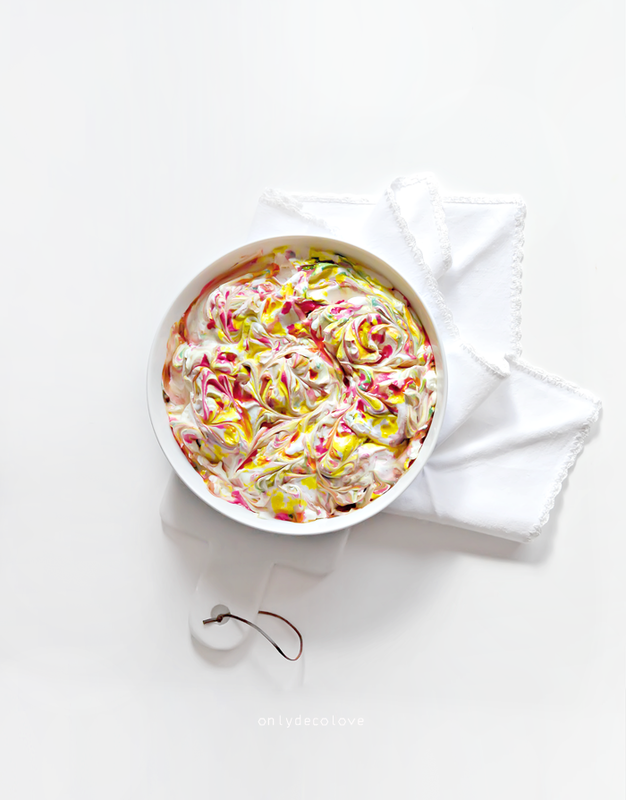 Fill a baking dish or any porcelain dish with the whipped cream. 3. Drip food coloring all over the whipped cream. 4. Using the toothpick swirl the whipped cream to combine the colors slightly. 5. Place the eggs in the whipped cream and gently roll once so the entire egg is covered. 6. Let your eggs sit for 10-30 minutes depending on how bold you would like the colors. 7.Remove your eggs from the whipped cream using gloves and rinse them quickly under cool water. 8. Let them dry on a paper towel and your eggs are ready! Tip : If you want the colors to look even more vibrant follow these steps before you submerge them into the whipping cream. Pour vinegar into a bowl and submerge the eggs in vinegar for about 2 minutes. Remove from vinegar and dry with a paper towel. Add a couple of drops of vinegar into the food coloring before you start dripping it onto the whipped cream. I like my eggs with less vibrant colors as you see above but if you prefer them less pale than mine using vinegar will brighten the colors considerably! Try this method once and I promise you, you will never look back again! Find me on Bloglovin for a new post everyday! Photographs taken by Katerina Dima unless otherwise stated. Hello lovely Ane!! So nice to see you here as well 🙂 I was surprised at how easy this is I called my mom to tell her and she let me know that when I was little we used to do that with yogurt instead! How can I have forgotten 🙂 I just love the results really and the fact they are so easy to make is a double bonus!Have a happy Easter as well!Lots of hugs! Merci beaucoup, c'est un moyen facile et amusant de la peinture des oeufs comme ça ! J'ai oublié mon français complètement, je suis désolé! Bisous!! Tusen takk!!! So fun and easy to do and they look amazing!! I did try the whipping cream but it doesn't taste as nice with all that coloring in unfortunately. I don't think it's bad for the body but it's definitely not tasty. But yes I do think doing this project with kids is going to be fun! It's fast and they will be so happy with the results and they get to at least lick the spoons 🙂 Good luck! True whipped cream and not a whipped topping? Wasn't sure from your use of the phrase "a tub of whipped cream." I passed up egg coloring this year as I just wasn't finding anything new and interesting to try. And then i found your beautiful post!!! And I am definitely going to have to give this a try. Certainly i love the results here! I prefer working with blown eggs – save them from year to year – and I am thinking that they would play quite nicely in the whipped cream and no need to weigh down as is necessary in a liquid. They probably have a specific gravity similar to whipped cream so would remain suspended while absorbing color! Thank you so much for this post! Can't wait to try these later! I live in France and it is impossible to find white eggs (all brown here). I hope the result is as nice as yours. Yesterday we blew out the content of the eggs and washed them. 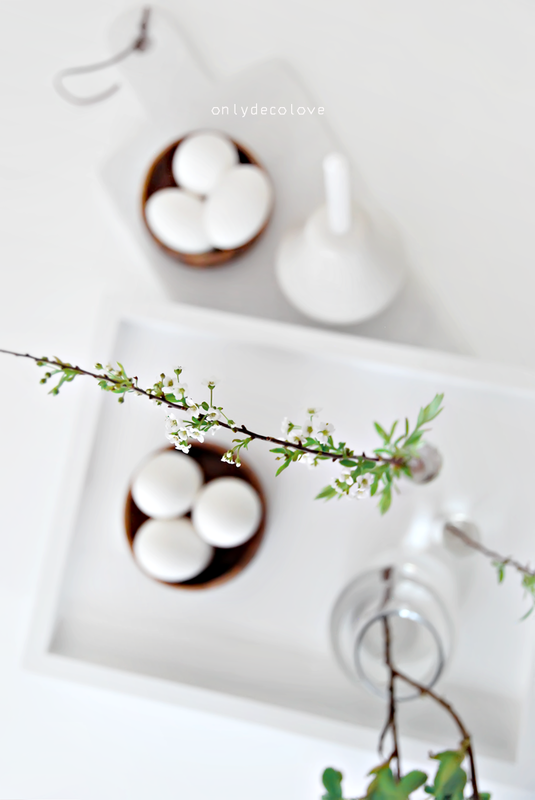 I love to do my easter projects with emptied eggs so I can keep them longer and I don't eat any chemical products. Tonight we will dye them. Fingers crossed! Modern Scandinavian/Nordic style is very distinctive and renowned in the design world. Last few years it has gathered a lot of support from the design community and I am extremely happy to see it grow. My style is very influenced by Nordic design although I still retain strong bonds to contemporary american, industrial and minimalism. It is no wonder Modern Scandinavian design has captured so much of my attention as it is born from the basic principles of modernism fused with traditional materials and can have the look of contemporary interior design. Ever since I created this Nespresso Coffee nook near our home office I have been waiting for signs of us getting tired of it. Some cleaning or some maintenance outside the kitchen is always expected to be tiresome, and even though there is nothing better than smelling the fresh coffee just inches away from where you work, I originally thought this wouldn't last past it's first month. This corner is so self sufficient that it barely needs any upkeep at all. We only refill the coffee machine with water and bring some cups to fill the crate when there are none left. There is no cleaning needed or any other maintenance whatsover. I chalk it up to the Nespresso machine being as self sufficient as is it however the credit here is not mine. From the many combinations of coffee I can make my choice today was an espresso con panna. Usually served in a bigger cup however the idea only dawned on me after the fact so I just improvised and served it with my new favorite Belgian waffle cookies. Doesn't it look mouthwatering? 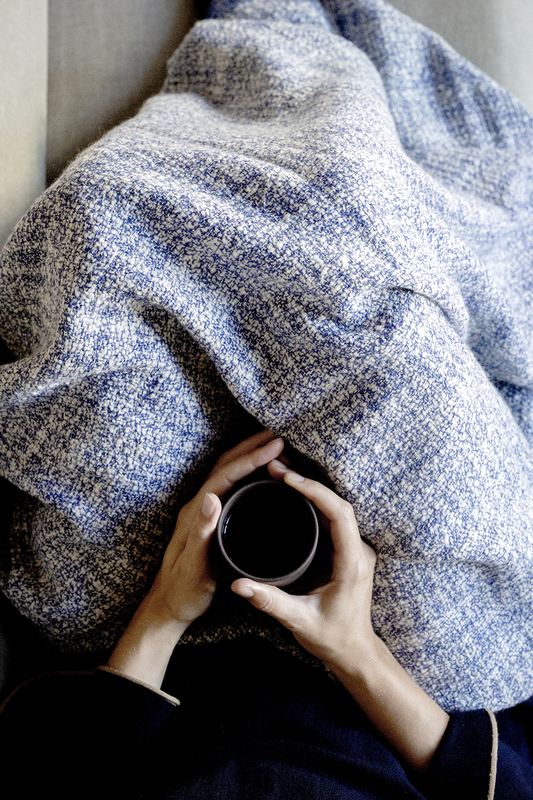 Even as I write this post I have already a new one brewing just inches away from me. I honestly cannot imagine how to start a better morning that this. Written content and design are the sole property of the site owner unless otherwise indicated. No part of this website may be reproduced without ONLYDECOLOVE.COM express consent. You may not copy,use or reproduce in any way any photos or content shown in this website without ONLYDECOLOVE.COM express consent. Any unauthorised use of the content published and owned by ONLYDECOLOVE.COM will be subject to fees in compliance with the copyright law.